The biochemical incubator is suitable for environmental protection, health and epidemic prevention, pharmaceutical inspection, agricultural and livestock, aquatic products and other scientific research, universities and production departments. It is a special thermostatic device for water analysis and BOD determination, bacteria, mould, microorganism culture, preservation, plant cultivation and breeding experiment. Is biology, genetic engineering, medicine, health and epidemic prevention, environmental protection, agriculture, forestry and animal husbandry industries such as scientific research institutions, universities and colleges, studio production unit or department laboratory of important test equipment capacity: 150 l, 250 l temperature range: 5 ~ 50 ℃ temperature uniformity: + / - 1 ℃ temperature fluctuation degrees or less: + / - 1 ℃ or less stainless steel tank, plastic spraying steel shell, polyurethane foam insulation Floodlight is equipped with large viewing window, microcomputer control, digital display precision is high. Unique stainless steel circular duct, forced air circulation, uniform temperature. Microcomputer control system, large screen digital display, touch type operation key, temperature limiting system, over temperature alarm automatic power interruption timing function ensure the safety of experiment. The design of super large double-layer hollow glass window is designed. There is a light in the studio, swich is easy to observe. The door uses magnetic rubber seal opening and closing operation, good sealing performance. The inner bladder is sealed with silica gel for two times, and the heat preservation effect is better. Stainless steel studio, four corners are half round arc, shelf support can be freely loaded and unloaded, easy to clean in the studio. The lighting system is easy to obsrve the experimental objects. A demonstration of the breeze circulation, the interior of the studio has a forced convection fan, with high temperature uniformity and low energy consumtion. The super quiet wind blower ensures long operation in a complex environment. 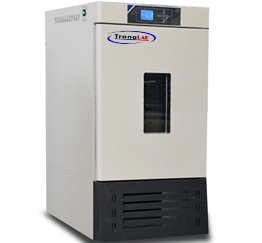 Fluorine free refrigeration compressor, high efficiency, low consumption and energy saving. Portable switch design, one key switch.